Near field communication is going to college and finding the campus to be an ideal testing ground full of students hungry for the newest technology. device – is a little hard to pass up. But like their business counterparts that have tested NFC, universities admit that its promise will remain unfulfilled until more NFC handsets are available. Both the University of San Francisco and Villanova University near Philadelphia are piloting NFC programs with the help of campus card provider CBORD. The results so far show that the technology works, students like it and they want to use it more. Ingersoll Rand developed the app and provided the hardware that turned an iPhone into an NFC-capable device, says Jeremy Earles, product marketing manager for readers and credentials at Ingersoll Rand. To begin, the participant connects a specially designed hardware accessory to the iPhone 4 or 4s. This hardware ‘sleeve’ slides over the phone and connects to the port at the bottom of the handset. The sleeve, manufactured by Wireless Dynamics, turns a non-NFC equipped iPhone into an NFC-capable device. Currently no other type of phone is supported, although Earles says Ingersoll Rand is considering developing the app for Android handsets as well. For the pilot, iPhones were selected because of their popularity on campus. With the sleeve connected, the participant requests an electronic credential for the phone. He receives an email with a link to download the dedicated app from Apple’s App Store. The app is launched, a password is presented, and the cloud then sends the credential to the iPhone, explains Earles. Now that the credential is securely in place in the handset, the student simply opens the app and taps the phone against the reader, says Earles. Offering NFC was the brainchild of Max Steinhardt, CBORD’s new president, says Bob Lemley, CBORD’s director of software development. “Max came to me a year and a half ago and said he wanted to do something with NFC. CBORD then went to its partner Ingersoll Rand. “They really got aggressive finding and managing pilot implementations,” says Lemley. The second reason is technical and made it easier to roll out an NFC project there. “They had just switched over to MIFARE contactless cards on campus,” he says. Thus they were already deploying contactless card readers to read the MIFARE technology, and these readers are also capable of reading NFC. 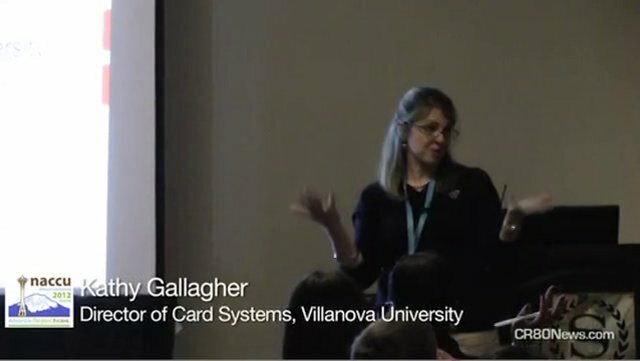 Kathy Gallagher, director of University Card Systems for Villanova’s Wildcard, says the school was looking for new technology that would enhance the student experience. “There was something exciting about being a pilot and our students are always looking for technically-advanced projects,” she adds. She says there were 54 participants including 22 staff members and 32 students. Seven locations, mostly dorms, were equipped with NFC readers. “We didn’t open this up to everyone on campus. We just wanted a small pilot,” says Gallagher. It involved students in three dorms covering exterior doors only. “We also had four locations for academic offices and buildings; my office was one of the four,” she adds. Rossi says that USF students cannot get by for more than an hour on campus without their smart card and the same goes for their phone. Phase one at USF focused on traditional undergraduate students in a residence hall, says Rossi. Twenty students participated along with several staff members. The second phase will test NFC at the point-of-sale in addition to continued use in access control. The participant base will include a larger number of staff members and will also incorporate graduate students. “We want to see how working professionals are susceptible to it,” says Rossi. Reactions from USF students were also positive, says Rossi. “There are some barriers in its current incarnation. For one thing, NFC is currently not native to the phone,” he adds.